In dealing with the subject of information overload before, I mentioned reducing clutter and aggressively culling unused RSS feeds, but I didn't know of a way to keep track of how long bookmarks have been kept. 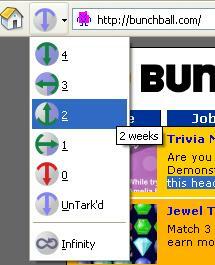 Tark is a Firefox extension that addresses this problem, allowing you to set a timer next to your bookmarks. This is most useful when you want to periodically cull your bookmarks, and you don't want to keep track of how long you've had each one. 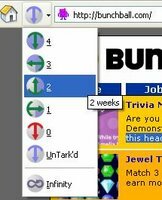 You select a time limit from 1 week to infinity from a drop down menu next to the location bar for each bookmark you want to make, and Tark keeps track of how long the bookmark has existed. At the end of the countdown, the icon will turn red so you can either remove the bookmark then or reset the timer. The only things I would ask for would be the ability to set a user-specified countdown and automatic removal of expired bookmarks. I understand why they aren't included since it would make the user interface more complex and might result in unintentional bookmark deletion. Nevertheless, this is still a very useful tool for dealing with bookmark clutter. Is Your Hard Drive about to Fail?